Recent news from Buckfastleigh is that machining on the wheelsets is complete whilst machining of the crankpins is underway. These then have to be fitted. 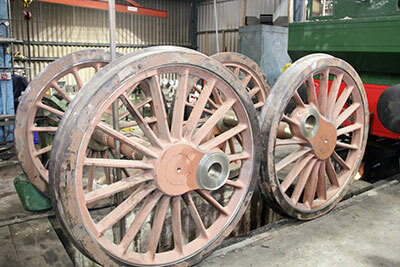 Finally the wheels have to be balanced before we see the wheelsets at Bridgnorth. 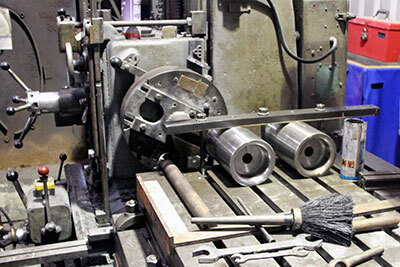 In the North East, the main flanges of the cylinder castings are machined and drilled with machining now taking place on the bores of the cylinders. 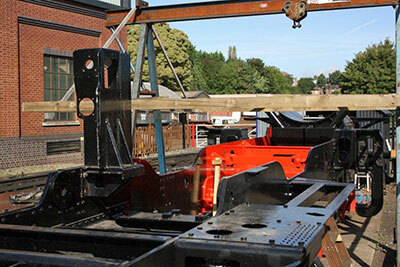 At Bridgnorth, machining of axleboxes, keeps and spring components continues as does the manufacture of pipe runs for vacuum and train heating around the front end of the chassis. The driver`s pedestal was fitted to the chassis and is pictured; this pedestal was one of the first parts we had made in 2008 so it is particularly pleasing to see it coming together. The great good fortune we have had in assembling such a multi-skilled team cannot be overstated - it has saved the project literally hundreds of thousands of pounds, enabling funds to be conserved for major items such as the wheels and boiler. Thanks chaps! The job of fabricating the bunker has been awarded to Boston Lodge Works of the Ffestiniog Railway; they have a well deserved reputation for the quality of their work and we look forward to receiving what will become a very eye-catching piece of 82045. The SVR's Andy Williams will complete the job with his superb painting and lining skills. The costs of this component have been covered by generous sponsorship from within the membership. Quotes are awaited for the manufacture of the cab and the two water tanks, again the subject of sponsorship. For some time, I have had in mind a high-quality Art Deco-style poster for the Trust, both for display at stations up and down the SVR and for sale in the form of prints, cards and so on. What finally galvanised me into action was reading an article in a recent issue of Heritage Railway entitled “Where Have All The Railway Poster Artists Gone?” This featured a superb image entitled Stonehenge, in the style of the classic railway poster, by artist Stephen Millership. Unable to get this beautiful piece of work out of my mind, I contacted Stephen to ask him if he would be interested in doing something for 82045. The reply was enthusiastic and the price reasonable, so I’m off to see him in early October to discuss a possible commission: he lives in Stockport, which is only about forty minutes’ drive from my home in Cheshire. I need to discuss the format with the artist, but what I have in mind is a stylised image of 82045 at a characteristic SVR location, for instance, crossing Oldbury Viaduct on a Kidderminster-bound train, with the distinctive outline of Bridgnorth Castle on its hill in the background. What I’d like to ask you is whether you have any suggestions for a good caption. I’ve racked my brains and the best I can come up with is Coming Soon - A Brand New Steam Engine For The SVR which is OK as far as it goes, but I’d be very pleased to hear from you if you have any better suggestions. Decent ones,of course. Please email or write to me at the usual address if you think you can help. Thanks! Earlier this year two young SVR fitters decided they would like to do a Freefall Parachute Jump and raise funds for our loco at the same time. The plan was to do the training and jump during the weekend of 16/17 August -over of all places Swindon! Frustratingly for our dynamic duo, at the eleventh hour the lads were told that the aircraft had failed so the jump was cancelled. 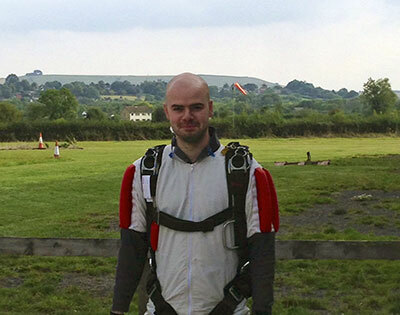 However Will Marsh and Gary Williams went ahead with the training and then the jump took place on 13th September 2014. We all felt ill at the thought but these brave lads had a wonderful time and have raised around £5,000 for 82045. We are very grateful to Gary and Will for risking life and limb for us..... and it is not too late to sponsor their deed. If you are inspired to acknowledge their effort with a donation just send a cheque to Mrs.Barbara Massau. 4 Southfield, Prestbury, Cheshire. 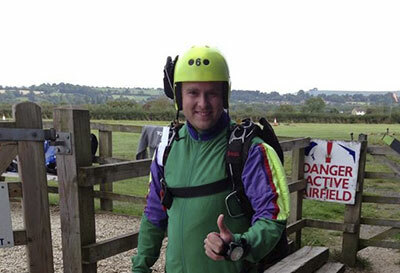 SK10 4XF – payable to The 82045 SLT and mark your cheque Parachute Jump on the reverse. Thank you and thanks to everyone who has already sent sponsorship. WELL DONE LADS and THANK YOU! This is going full steam ahead, and is expected to break through the £100,000 barrier by the end of October, two months earlier than we’d originally hoped for! The aim is to get to £150,000 by the middle of 2015, at which stage we hope that construction will start. Following the piece in August’s updates, a member has come forward with an offer to sponsor the smokebox tube plate. He is a long-standing supporter but wishes to remain anonymous, so thank you so much for your great generosity, Mr B! The copper firebox tube plate remains up for sponsorship, or part-sponsorship - at £22,500 it’s an expensive item, so any contribution towards it would be very welcome and would be appropriately acknowledged with a sponsorship certificate. We do have the funds to pay for these patterns, but are trying to put as much money as we can into the boiler account, so any contribution can definitely be regarded as helping the boiler appeal. Let Chris know if you are interested. The wheelsets pictured at Buckfastleigh on 17th September 2014. Photo: 82045 supporter Chris Shields. Machining the crankpins at Buckfastleigh, 17th September 2014. Photo: 82045 supporter Chris Shields. 82045 complete with drivers's pedestal. 8th September 2014. Photo: Tony Massau. 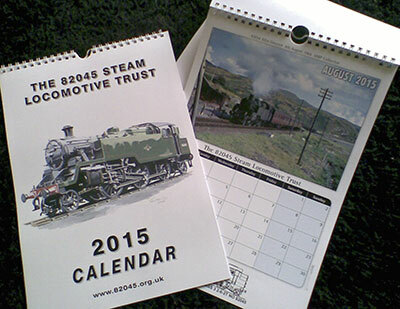 Our new calendar is now available - it is in full colour this time and costs £6.00 plus £1.20 p+p. Please send your cheque to Mrs Barbara Massau, 4 Southfield, Prestbury, Cheshire SK10 4XF.